Before Einstein, the energy-momentum relation for massive particles and massless particles were E = p2/2m and E = cp respectively. Einstein combined these two separate formulas into one. As we know well, Einstein's work was not trivial. In 1964, Murray Gell-Mann invented the quark model in which hadrons are quantum bound states of more fundamental particles called quarks. Five years later, in 1969, Richard Feynman observed that a hadron, when it moves with a speed close to that of light, appears as a collection of infinite number of partons with a wide-spread momentum distribution. Partons interact incoherently with external signals. 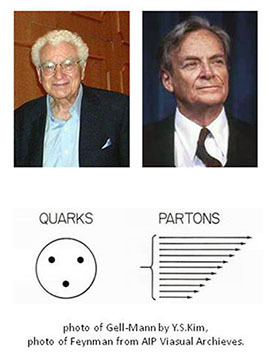 It is only natural to regard the parton picture as a Lorentz-boosted quark model. However, since the partons are so different from the quarks, we have been wondering whether they are really Lorentz-boosted quarks. Click here for further contents of Einstein's E = mc2. 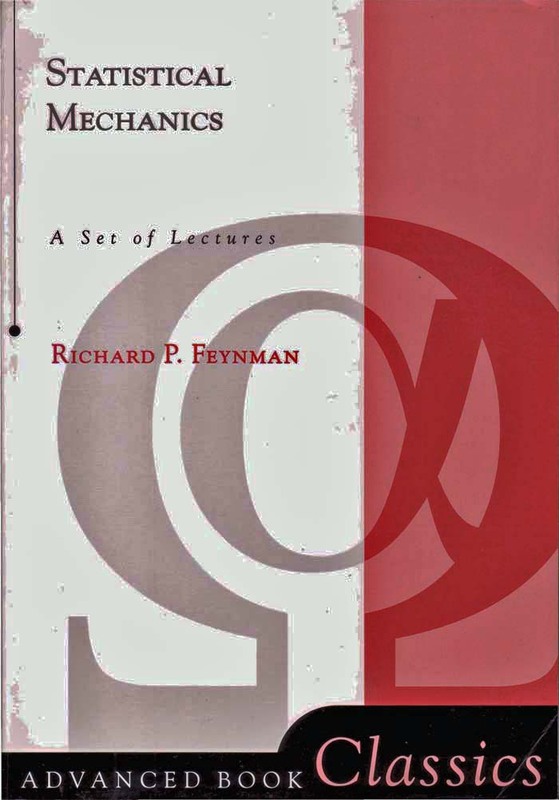 According to Feynman, the adventure of our science of physics is a perpetual attempt to recognize that the different aspects of nature are really different aspects of the same thing. If this is the case, we are doing the same physics whether we do the quark model or do the parton model. Indeed, ever since Feynman presented his parton model in 1969, one of the most pressing problems in high-energy physics has been whether it is possible to formulate a covariant theory which will produce the quark model for slow hadrons and the parton model for fast hadrons, within the framework of the existing rules of quantum mechanics and special relativity. 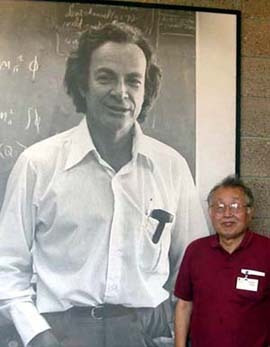 In this photo, one Feynman admirer is standing in front of Feynman's preterit at the entrance of the Feynman Computing Center at Fermi National Accelerator Center, Batavia, Illinois (June 2003). He has been doing Feynman's physics since 1970. According to Ne'eman, Feynman diagrams and the parton model are the two greatest contributions Feynman made. Feynman diagrams are well known and well understood, but his parton model is yet to be understood. Why is it so difficult to understand the parton model? It contains too much physics, including some of the current issues such as decoherence, as well as future issues. How can we construct a covariant model for quarks and partons? Let us start with a hadron consisting of two quarks bound together by a harmonic oscillator potential. 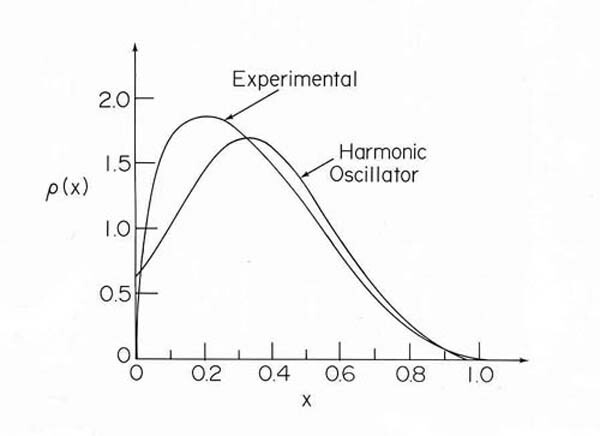 The simplest wave function for this two-particle system is is the harmonic oscillator wave function. Can this wave function be Lorentz-boosted? Its boundary condition can be stated in terms of the spatial coordinates in a given Lorentz frame. Then how about other frames where the spatial and time-like coordinates are mixed? In order to deal with this problem, we need the time-separation variable. Does this variable exist? We are quite familiar with the Bohr radius. It measures the spatial separation between the constituent particles. Then, is there a time-like separation? According to Einstein, the answer is YES. 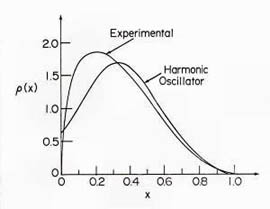 This is the starting point of our plan to construct a harmonic oscillator wave function which can be Lorentz transformed. Let us tackle this problem with the following three figures. The first figure is a space-time diagram of the harmonic oscillator wave function. 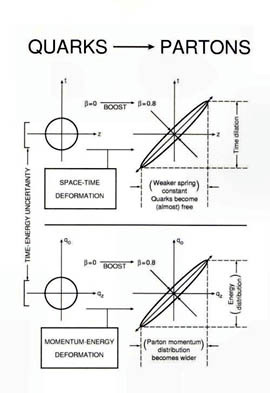 The second figure describes Lorentz boosts in the light-cone coordinate system. The third figure combines quantum mechanics with special relativity by combining the first two figures. The present form of quantum mechanics. Let us consider a hadron consisting of two quarks bound together by a harmonic oscillator potential. 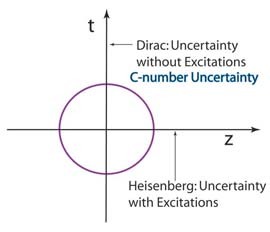 Then, Heisenberg's uncertainty principle applies to position-momentum coordinates, and there are excited states along the space-like directions. As for the time-like (time-separation between the quarks), there are no excitations, but there still exist a time-energy uncertainty without excitation. 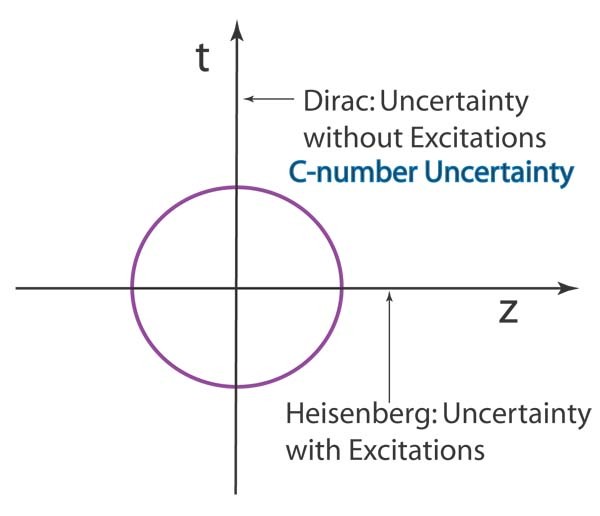 According to Dirac, it is a c-number time-energy uncertainty relation. (z + t)(z - t) = constant. 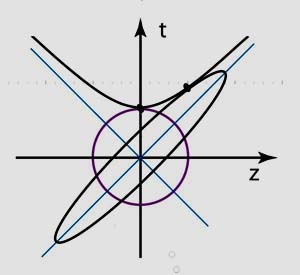 The Lorentz boost along the z direction expands (z + t) and contracts (z - t) while keeping the above product constant. This is called Dirac's light-cone coordinate system. 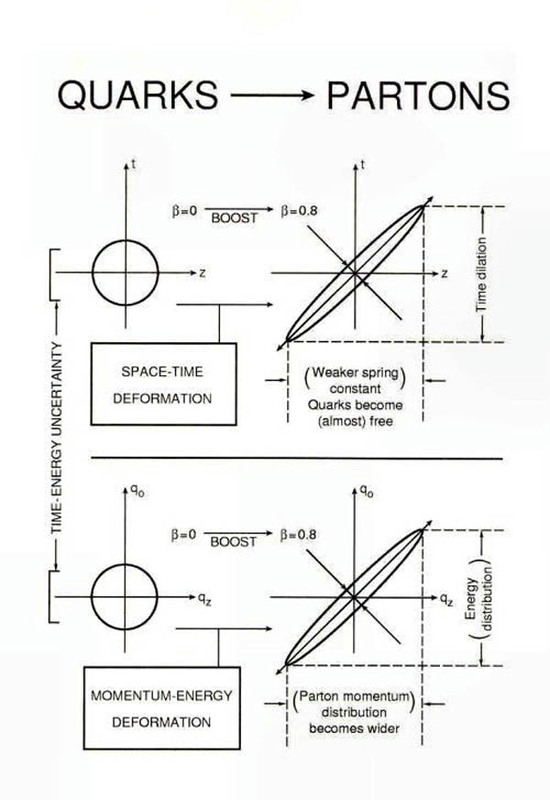 The Lorentz boost is now a "squeeze" transformation. It is then easy to combine quantum mechanics and special relativity. We can now Lorentz-boost quantum mechanics given in the first figure. We can simply squeeze the circle given in the first figure according to the transformation law of special relativity given in the second figure. Einstein and Feynman. Dirac talks about them. Can you boost a quark-model wave function to get a parton distribution? 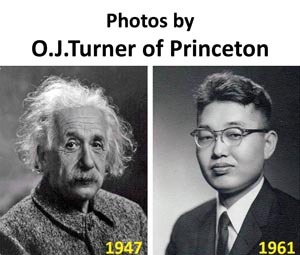 Y. S. Kim, Phys. Rev. Lett. 63 , 348 (1989). 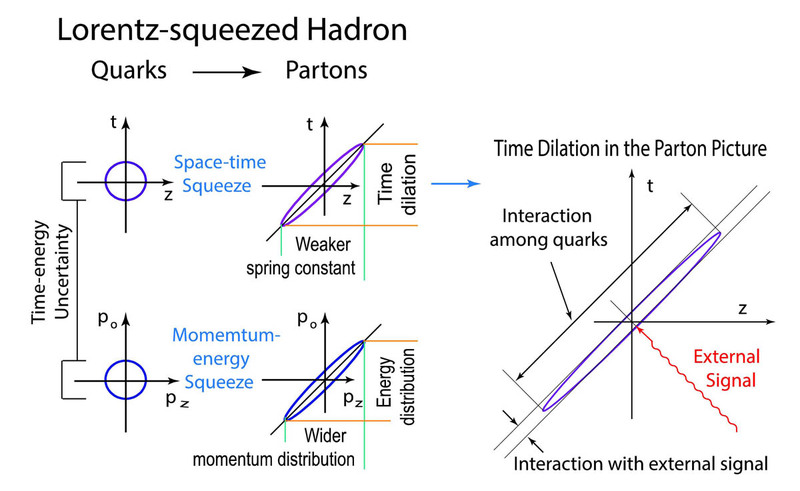 This figure explains how a Lorentz-squeezed hadron become a collection of partons. As the hadron moves fast, the quark distribution becomes concentrated along one of the light-cone axes. The amplitude of the oscillation becomes larger, indicating that the spring constant appears to become weaker. The particles become free! The momentum distribution becomes also widespread. This is what we see in the world through Feynman's parton model. The number of partons is infinite because free particles have continuous momentum distribution as in the case of black-body radiation. The major axis of the ellipse measures the period of oscillation. As Feynman observed, the interaction time between the quarks is dilated. We are of course interested to know whether the parton distribution calculated from the covariant oscillator formalism is in agreement with the distribution observed in the real world. This graph will indicate that the answer is YES. 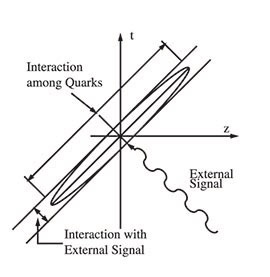 One of the most puzzling aspects of Feynman's parton picture is that while the quarks in the quark model are interacting coherently with external signals, partons interact without coherence. A single parton interacts with the signal without any interference by other partons in the same hadron. Feynman observed this incoherence and explained that this is due to the relativistic effect of time dilation. Can this observation be made quantitative. In this picture of the Lorentz-squeezed hadron, the major axis corresponds to the period of oscillation. It tells how often the quarks inside the hadron meet. The minor axis tells how long it takes the external signal to interact with the single quark. If the total energy of the hadron is 1,000 times the mass, the ratio of the major axis to minor axis is 1,000,000. Thus, other quarks in the same hadron do not have a chance to interfere with the quark interacting with the external signal. Of course these can be explained in terms of mathematical formulas, and they are given in many published papers. The following two review papers may be helpful. Feynman's Decoherence. Does the Lorentz boost destroy coherence? Covariant Oscillators. See Section on Feynman's decoherence in this paper. If the partons and the quarks are the same particles viewed from different from different Lorentz frames, why is the number of partons infinite while the number of quarks is two or three. Let us look at this figure. If you are not familiar with this figure, Click here for explanation. As the hadron is boosted, both the space-time and momentum-energy wave functions exhibit the Lorentz-squeeze. As a consequence, quarks become like massless particles moving with the speed of light. Because of the wide-spread longitudinal distribution, the spring constant appears like very weak, and quarks appear like free particles. At the same time, the momentum distribution becomes wide-spread. If free massless particles have a wide-spread momentum distribution, it is like the black-body radiation: infinite number of massless particles. When we solve a quantum-mechanical problem, what we really do is divide the universe into two parts - the system in which we are interested and the rest of the universe. We then usually act as if the system in which we are interested comprised the entire universe. 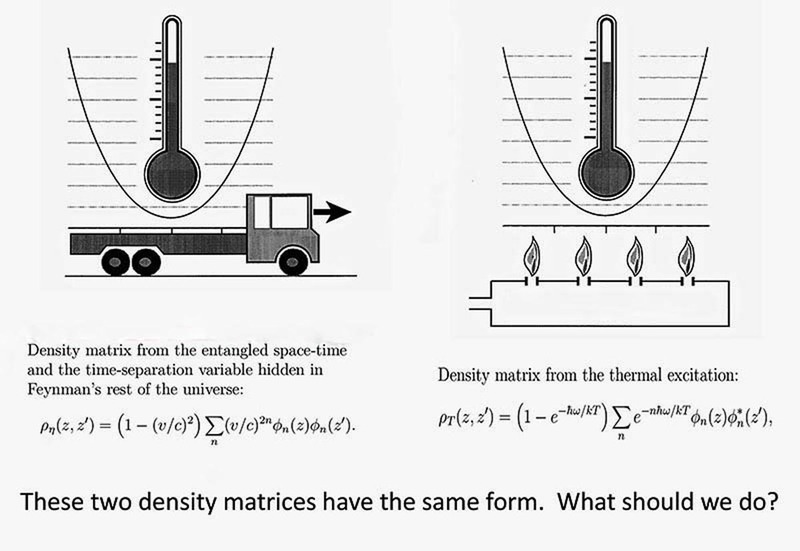 To motivate the use of density matrices, let us see what happens when we include the part of the universe outside the system. The Bohr radius is an important quantity in quantum mechanics. It is a space-like separation between two particles. However, if the system is boosted, the time-like separation becomes prominent. This problem goes back to Bohr and Einstein. They met often, but they never discussed this issue. Click here for a story. Since there are no theoretical tools to deal with this problem, this variable is in the Feynman's rest of the universe. On the other hand, von Neumann's approach to entropy tells us how to deal with the variable we do not measure. If they are not measured, they appear as an entropy increase. Let us look at this figure. Click here for detailed calculations. The entropy increase means an increase in temperature. This thus leads to the following figure the phase transition from the confined state to a plasma state. Click here to expand the left side of this figure. copyright@2014 by Y. S. Kim, unless otherwise specified.